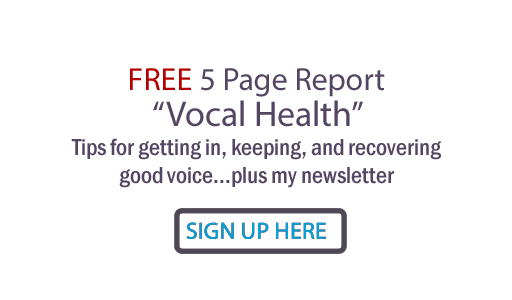 Judy Rodman - All Things Vocal Blog: What's Wrong With Your Vocal Warm-up? You are doing the wrong exercises for your voice. Contorting your face, tongue or jaw as strenuously as you can. Stretching is good, but stretching any muscle all the way causes your automatic nervous system to apply a 'knee-jerk' contraction to prevent tearing. That's a good way to set up tension and even muscle spasm at the TMJ. Move your face around and loosen it, yes, but never as radically as possible. Or keeping your face (eyes, jaw) as still as possible. Sorry, once again I find this common admonition counterproductive. To test this yourself, try singing or speaking a short phrase with a frozen face. Then do it again with a very active face such as you would use with a baby or puppy. See what I mean? Using vocal fry exercises. Some coaches use this but I find this extremely counterproductive and fatiguing. Don't even use it in your speaking voice! Projecting air pressure for volume, which goes along with a misunderstanding of what 'healthy belt' voice is. Your rich and controlled volume should come from a balance of support and control, not just support. Your vocal cords should never feel the air push through them! You are doing healthy vocal exercises but incorrectly with bad form. Yes, it's great to do lip bubbles and tongue trills. But if you push them, even they can cause tension! Why would you want to practice tensing your voice?? Scales of all kinds can open up your range. But if you don't know how to 'lift before you sound' you'll push into your highs and lows. And then of course, you'll perform as you practice. Just like pumping iron, if you go too far or too long with vocal exercises, you can hurt yourself. Here's the rule: If it hurts, STOP! No pain is gain when it comes to your voice. It's OK to challenge yourself, but not til it hurts. You are warming up your voice too fast. Use common sense here. Again, like any physical endeavor, if you go from zero to 60 (or even two if you're really cold), you can create the opposite of a warmup. Let those tissues flexing and getting some blood flowing before moving to the next level of intensity. f you can't do something yet, DO NOT PUSH ! Just take a calming breath, back up and begin at an earlier place in your warm-up until your voice says 'yes' to being challenged. You are not doing your vocal exercises long enough. If you've been singing or touring a lot and your vocal stamina is up, you may need 5 or 10 minutes of warm-up. If you haven't been singing regularly, have been sick or just have some mucous build-up, you might need 20 to 45 minutes. How do you know? Your voice feels great and is working like you want it to! I recently re-learned the wisdom of taking enough time to completely warm up my voice before performance. I woke up with some gunk coating my throat that seemingly would just not let go. I was afraid I was going to be able to do my lead vocals that day. But I kept on slowly and carefully challenging my voice, finally shook the gunk off, limbered my instrument up and nailed those vocals that day. The same thing has happened to me numerous times for stage performance. Use common sense and don't over-do vocal exercises too long and too strenuously if you have a long performance that day. Again, at the end of your exercise, your should feel great, not tired! Next time you warmup... assess how your voice feels immediately afterwards. If it doesn't feel great, get to the bottom of 'why not'. If you don't know HOW to do vocal exercises properly, DON'T DO THEM! Just sing easy songs and do tongue tanglers to warm your voice up. Get a trusted vocal coach to teach you how to do vocal exercises that fit your voice. Remember: your vocal warm-up is not supposed to be a vocal tighten-up! I've doing the same warm-ups since college (20+ years!). Do I need to revisit this? Greentub... first of all, congratulations on your dedication to your voice! I'd say ask yourself the questions in the post. How does your voice feel? Would you like to take your vocal ability farther or are you satisfied where you are? But no matter what, I WOULD revisit the way you're doing the exercises you have. Make sure you haven't gotten lazy with form. Thanks for writing! YES absolutely you can do that CD for Christmas, Terrry! Can't wait to help you do it. Very much looking forward to Charlotte's poetry book, too. Will trade for our CD:) Love and Happy New Year to both of you... from our house to yours! How and When Should You Copyright A Song?